Plumbing involves not just the supply of water to your home but the discharge of waste from your home too. As such the toilet bowl plays an important role in ensuring that the waste created by your body is properly discharged out of your home. repair and replacement of flushing component. We are a distributor of toilet bowl for both HDB and private projects, we carry both new toilet bowl models as well as repair spare parts for various brands in the market. Our plumbers are experience with various issue that you can face with regards to toilet bowl. Most repairs to toilet bowl involves repairing of leaks in the toilet bowl or surrounding the toilet bowl. 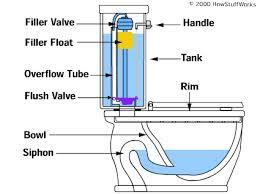 We have to view the toilet bowl as part of the entire plumbing system with the inflow of water to the out flow of water after flushing. As seen in the image above, there are several parts involved that helps to ensure the toilet bowl works in the manner it is supposed to. Most of the component of the toilet bowl are concealed within the flush tank which also acts as the water storage area. Its main responsibility is to ensure that the water is stored within the tank till it is to be released. However, issue can arise should the water in the tank over fills itself. For the discharge of water, the main parts involved would be the bowl as well as the siphon that leads the water out to the drainage pipe of the building itself. Most of the parts mentioned above can be repaired or replace. What is important to note thou is that there is no 1 part fit all solution in the market. As there are various brand in the market, the manufacturer of the toilet bowl can use parts that is exclusive to their brand only. As such a on site check is required by our technician to assess the repair cost. Beside toilet bowl repairs and replacement, we provide a full range of plumbing service. Do contact us should you need any other information.